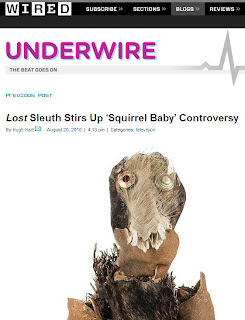 The speculation over the props in the LOST auction is growing, this article on the Wired magazine website talks about our old favourite "Squirrel Baby". It is worth noting that the online item descriptions on some lots, including SB, have started to be changed. So those bidding online or even in the auction room need to make sure they are comfortable with the description that the auctioneer gives. With little or no indication in the printed catalog of what was on the cutting room floor and which was used on screen the only advice I have to give is the old addage "Let The Buyer Beware"
This is the last time this site will mention this before the Auction starts, but it is a shame that Profiles in History could not have been more upfront and communicative on what items are genuinely used on screen or used by the actors and which are production duplicates that were never used.